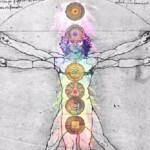 It releases the 7 chakras, which exist within our ‘Energy Body’. Chakras are points through which energy flows, from one person to another. Chakras open and close, according to our emotions / attitude. This, in turn, affects if the chakras become blocked. Lie down, close your eyes, and have music playing, that is heart-opening to you. FIRST CHAKRA – Apply cedarwood or frankincense or tea tree blend, to your base / root chakra (perineum) – This chakra has to do with basic survival – anything in your life which threatens your physical survival – things like not enough money or abundance, can make you feel as if you can’t move forward in your life. Feel where it is ‘tight’, then gently release the tightness, while calmly considering the things in your life, which are causing this tightness. SECOND CHAKRA – Apply orange or lemongrass blend to your sacral chakra (center of lower abdomen) – This chakra has to do with sexual pleasure – anything in your life which threatens your sexual pleasure – things like aloneness / emotional abuse / unkindness, can reduce the natural pleasures of sensuality, which is our birthright. THIRD CHAKRA – Apply grapefruit or lavender or lemongrass or peppermint or orange or chamomile or lemon blend to your solar plexus chakra (solar plexus) – This chakra has to do with your ability to make things happen, which in turn, is caused by your sense of worth – anything in your life which threatens your power to make things occur, can make you feel powerless and frustrated. FOURTH CHAKRA – Apply rose absolute or lavender or orange or lemon or peppermint or eucalyptus to your heart chakra ( heart area) – This chakra has to do with your ability to give and receive love – anything in your life which threatens this ability, such as: feeling rejected / reduced / invalidated /evaluated / misunderstood / can cause the flow of love to become blocked. FIFTH CHAKRA – Apply chamomile or frankincense or tea tree or peppermint or lavender blend to your throat chakra (base of throat) – This chakra has to do with the ability to speak freely, and thus allow creativity – anyone in your life who prevents you from communicating honestly, can prevent you from reaching towards your goals. SIXTH CHAKRA – Apply frankincense or chamomile or lavender blend to your brow chakra (center of forehead) – This chakra has to do with thoughts making sense, confusion going away, understanding all which is perplexing. Some may call it spiritual wisdom – anyone or anything in your life which adds to your confusion, can make you feel dizzy, spaced out, unclear, or unsure. SEVENTH CHAKRA – Apply cedarwood or frankincense or lavender to your crown chakra (top of head, center) – This chakra has to do with the way you personally connect to God / The Universe / Creation. It is sometimes referred to as Spirit. There are many reasons for feeling disconnected from Spirit, but sometimes, if the previous 6 chakras are blocked, then this can cause the Spirit chakra to feel blocked. The idea is not to SOLVE or ANALYZE the above issues – only to IDENTIFY them, and to RELEASE as you identify them. Its a powerful technique, because it removes “intellectual analysis”, and replaces it with some truly beautiful feelings.